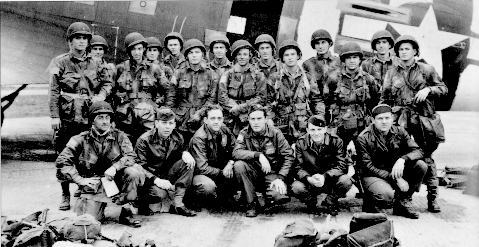 Paratroopers carried an average of 70 pounds of equipment. Officers averaged 90 pounds of gear. With the parachute, men weighed in at 90-120 pounds over their body weight. machete, .45 caliber Colt automatic rifle, flares, message book. wire cutters, radio batteries, small-pack, basic equipment webbing, 48 hours worth of rations, water, cooking and washing kit. Spread throughout pockets: loaded .45 automatic pistol, medical kit, 2 additional lb. HE, knife, escape/survival kit, toggle rope, additional personal items. is the pathfinders of the 101st. There job was to find the drop zones and set a becon telling the paratroopers to jump. Unfortunatly, only one third of them made it to there drop zones.